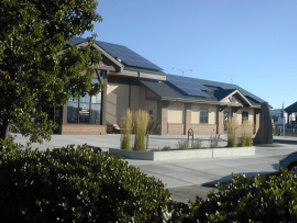 The Coos Bay Visitor’s Center is a 3,600 S. F. building housing a 2,400 S. F. Visitors Center and 1,200 S. F. of leasable office space. 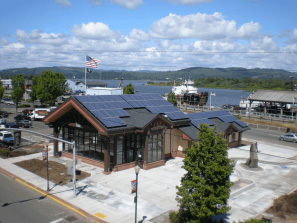 The Center was designed to combine the proud history of the community in logging and shipping with its important civic location, connecting the mercantile core with the waterfront. The Center is located in the heart of downtown Coos Bay. 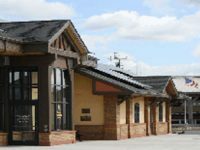 The City’s goal was to create an eye stopping building that provides an inviting Information Center for tourists with ancillary office/volunteer accommodation and 24 hour restrooms. 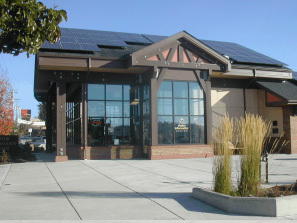 The completed facility also provides meeting facilities for the community and downtown businesses. The facility incorporates modern energy conservation solutions including a photovoltaic array on south facing roof slopes. It has high efficiency light fixtures, a high efficiency heating and cooling system, and a tankless water heater fueled by natural gas. The carpet is manufactured from recycled products, all paint and stains are low VOC, and all wood products and lumber are from certified managed forests. Extensive use was made of natural lighting to reduce overall illumination requirements and occupancy sensors were used in all rooms to reduce energy consumption during unoccupied periods. The City received rebates for the use of high efficiency light fixtures and high efficiency heating system from the Energy Trust of Oregon at project completion.